This Flashback Friday needs a bit of a clarification. but it was released it with a new cover in March 2017 preceding the release of Written in Stone, the 3rd book in the series. I added the book to my wish list last year when the 2nd book in the series tour with Great Escapes. Alicia Fairmont is struggling to move on after her husband’s death. She didn’t know much about his family and they didn’t show up for the funeral. She thinks that if she connects with them it will bring her the peace she needs to get on with her life. She knows he considered Cobble Cove his home she she hopes to find some answers there. Soon after arriving she meets John McKinney, publisher of the local newspaper and he agrees to help her find out her husband’s mother and his sister. She also meets his father and the library director. The director hears that Alicia is a librarian and quickly offers her a job. While considering the offer she receives a call from home that her home has been burned to the ground. John accompanies her back to deal with all the aftermath. But her mind is still back in Cobble Cove. She wraps up what she can and returns back there to try to get the answers she needs. Instead of a simple meeting of her in-laws she uncovers secrets, clues and evidence that turn the whole thing into quite a mystery. Many things are not what they seem and everything she learns takes her in a new direction until the last clue puts everything in order. This is a complex mystery that is very well written. I had a couple of issues about how quickly certain events take place but as I delved further into the story those became minor glitches. Cobble Cove is an unusual town and not typical for a cozy mystery. It felt very dark to me at times. The town is full of cottages with whimsical street names but there was just a pallor over the town. People are hiding something from Alicia and the story was getting a more suspenseful feel, but never truly veered into the thriller genre. I liked Alicia but my verdict on John was out until almost the very end of the story. In fact I wasn’t trusting of anyone in Cobble Cove until the final pages. There is a wide variety in the personalities of all the characters, the bubbly townspeople that are on every committee, the shut-ins who have books from the library delivered to them, the detective that was downright rude, Dora,who runs the only place to stay in town, and of course John, his father and Sheila, the director of the library. De Louise is an excellent storyteller. Her descriptions of time and place took me right into the pages. She includes many twists and turns to keep us as readers motivated to keep those pages turning. Everything wraps up nicely by the end of the story. If I didn’t know this was the first book in the series I would have thought it was a stand alone novel. This story was different and so much more than I expected when I started reading. It is a very entertaining mystery coupled with a unlikely romance. I will definitely be checking out the next two installments. Debbie De Louise is an award-winning author and a reference librarian at a public library on Long Island. She is a member of Sisters-in-Crime, International Thriller Writers, and the Cat Writer’s Association. She has a BA in English and an MLS in Library Science from Long Island University. Her published novels include Cloudy Rainbow, A Stone’s Throw , Between a Rock and a Hard Place , and Written in Stone . Between a Rock and a Hard Place (Cobble Cove Mystery #2) has been on the Amazon bestseller list for cozy mysteries. 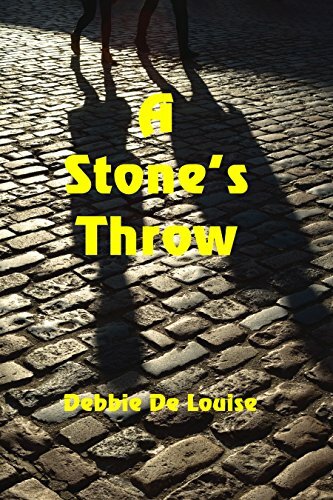 Debbie has also written articles and short stories for several anthologies of various genres and a romantic comedy novella, When Jack Trumps Ace. She is currently seeking agent representation for her psychological thriller, Sea Scope. Debbie lives on Long Island with her husband, daughter, and two cats. Thanks so much for hosting me, Lori, and for the great review. I’m glad you enjoyed the first book of the series. I love the sound of this story. I’d love to read it. Sounds like a great series. Would enjoy reading. And she (kind of) thought she knew her husband.